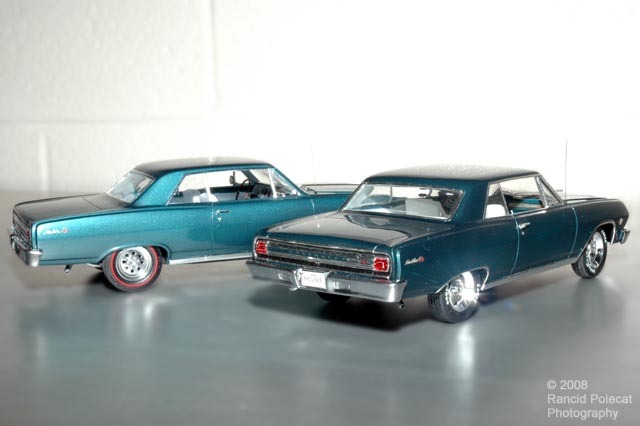 Working with Revell's 1965 Z-16 Chevelle kit, Charlie started both build ups by reworking the tail panels with Model Car Garage photoetched conversion pieces and clever paint detailing. He went on to enrobe both bodies in GM Tahitian Turquoise from Model Car World and accented them with a bright combination of Bare Metal Foil and photoetched emblems from Model Car Garage. Charlie spend a great deal of his time on these projects removing the molded-on bumper guards from the front and rear bumpers. He finished his handiwork with Alclad-II Chrome paint. Added details on both cars include windshield wipers from Detail Master, antennas made from lengths of guitar string, and computer generated license plates.